> How to name Aboriginal people? Using the right name for Aboriginal people shows respect, shows that you care, combats racism and might open doors. But which name is the right one—Aborigine, Aboriginal or Indigenous? Anti-racism campaign of the City of Sydney and the AIDS Council of New South Wales in May 2008 (detail). Note the use of the word 'Aboriginals', a term which is no longer appropriate. Click the image for a larger version. What do you think are suitable expressions to address Australia's first people? Although all these names are commonly used they are the legacy of colonisation. Let's have a closer look. 'Aborigine' comes from the Latin words 'ab' meaning from and 'origine' meaning beginning or origin. It expresses that Aboriginal people have been there from the beginning of time. 'Aborigine' is a noun for an Aboriginal person (male or female). 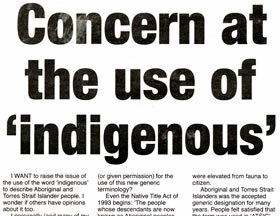 The media, which is still using this name, has been called on to abandon using 'Aborigine' because its use has "negative effects on Aboriginal and Torres Strait Islander peoples' self-esteem and mental health" . Aboriginal is an adjective and used to describe 'Aboriginal people', 'Aboriginal houses' or an 'Aboriginal viewpoint'. Some sources use it as a noun which I and many other people think is wrong. 'Aboriginal' is often written with a capital 'A' to show respect to Aboriginal people but also to differentiate Australian Aboriginal people from the aboriginal people all over the world . Using 'Aboriginal people' or 'Aboriginal person' has been recommended by the Aboriginal Advisory Group of Community Legal Centres NSW  because they are "more positive and empowering terms". If you want to be exact you would need to talk about "Aboriginal and Torres Strait Islander people" because people from the Torres Strait identify strongly with their islands. When you refer to an individual Aboriginal person it is better to refer to them with their language group, e.g. 'Budjalung woman Jane Smith'. 'Indigenous' is still commonly used to refer to Aboriginal people, often in exchange with and to avoid repetition of 'Aboriginal'. It is derived from the Latin word 'indigena' meaning 'native to the land' or 'sprung from the land'. Historically 'indigenous' was used to describe animals and plants, and later Aboriginal people. If you open your wallet you can verify that even modern Australian coins show flowers, animals and—an Aboriginal person's head. 'Indigenous' also generalises mainland and islander cultures into one. Both groups have very different culture, customs and flags. Many Aboriginal people dislike being referred to as 'indigenous'. Some Aboriginal people consider the use of the name 'Aborigine' racist. Both terms, 'Aborigine' and 'Indigenous' are umbrella terms often used for convenience. Many older books and articles talk of "the natives" or "blacks" when they refer to Aboriginal people. Don't use any of these labels now, they are considered racist. Or maybe they are not, as the following story illustrates. "Why I prefer the term ‘black’"
Celeste Liddle is an Arrernte woman from Central Australia. She explains why she likes to call herself a 'black' woman . "When referring to myself, and particularly talking with someone who I assume won’t understand what I mean by ‘Arrernte’, I tend to use the term ‘Black’. "Why? Because in this country the term ‘Black’ carries a lot of political weight. It is [a] word that has power and a term that we’ve reclaimed. After years of removal policies and stolen generations based on the tone of one’s skin and their alleged blood quanta, to state that you are ‘Black’ regardless is defiant. "It proclaims resilience in the face of harsh assimilation policies proudly." In Aboriginal publications (for example in the Koori Mail newspaper) the label 'Aboriginal and Torres Strait Islander people' is used frequently to include Australia's mainland ('Aboriginal people') and Torres Strait islander people. If given the choices we discussed so far, Aboriginal people do not agree on a 'preferred' name, but some labels find the support of many. Some older Aboriginal (and non-Aboriginal) people use "Aborigine" and "Aboriginal" interchangeably or the first exclusively, mostly younger people will only ever use "Aboriginal" and will have strong opinions about why. 'Aboriginal' and other such European words do not exist in Aboriginal languages. Prior to colonisation Aboriginal people identified by their language group. They would say "I'm a Dharawal man!" or "I'm an Wiradjuri woman." Some country names around the greater Sydney area include Gundungurra (near Goulburn, south-west of Sydney), Dharawal (Woolongong), Eora (Sydney; although this name is disputed), and many more. Others might prefer to use a name that refers to the area within Australia where they live. For example, Koori is used by people living in New South Wales and Victoria (the latter sometimes using 'Koorie'), while Murri is used for Queensland and far northern NSW. "The name Yunupingu means a Rock, the rock Yunupingu stands in the middle of the ocean. The rock was his strength, 'A rock that stands against time.' His formal identity is Maralitja, Dhukulul, Ngunbungunbu, Barrupa, Rarrkararrka. These are his very important names identifying who he was and where he comes from." Which role had Dr M Yunupiŋu in Yothu Yindi? Why am I not using his full first name? What is it, and what does it stand for? Find out what the names of his "formal identity" stand for. Compare how this man must have felt about his name to how you feel about yours. Every now and then Aboriginal people discuss which name is appropriate when people refer to them. "I hate the bloody word ['Indigenous']. United we stand." "Let's get rid of the 'I' word... I am what I am—I am Aborigine." "Using Indigenous is to me inclusive of our Torres Strait Islanders who are also part of our country but do not always refer to themselves as Aboriginal." "I think there is enough division in our communities now without anyone being more divisive about words... Let's be inclusive, not exclusive." "I am Bundjalung, not Indigenous, I am an Aboriginal man." "In my lifetime, I have heard too many people use the term Aboriginal to attack us. It's a word that cuts deep because it has been used with such hatred." "The word Aboriginal does put us in the same category as plants and animals etc because basically the words Aboriginal and Indigenous mean the same." "I am Koori... Don't we have more important things to worry about?" The Aboriginal-owned newspaper Koori Mail tries to be as specific as possible when writing about Aboriginal people. It recommends the following hierarchy in descending order of preference. The person's language group, e.g. Wiradjuri. The area the person comes from, e.g. Murri. Aboriginal if they come from mainland Australia, Torres Strait Islander if they're from there. Aboriginal and Torres Strait Islander (ATSI) to be generic. On this site I've chosen to use 'Aboriginal people' without any intent to offend. 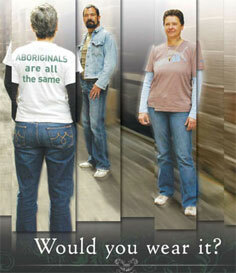 For more on this topic read the article about Aboriginal identity. Unfortunately many Aboriginal people begin to identify with, and behave in accord with the 'toxic labels' Australian society defines for them . It is easier to act as mainstream Australia perceives an Aboriginal person than to challenge that cliché and overcome a continued negativity attributed to the Aboriginal stereotype. According to senior Aboriginal academics even terms such as 'urban', 'traditional' or 'of Indigenous descent' are seen as racist when defining or categorising Aboriginal people . Browse a list of appropriate terminology for Aboriginal topics to avoid using a term that might offend Aboriginal people. While some Aboriginal people have no problems with identifying themselves as Australian, others vehemently reject such an association.